Happy spring! This issue is our annual Senior Living and Multi-Residential focus. The Boston Planning & Development Agency recently approved “development projects in neighborhoods across the city of Boston which will result in hundreds of market-rate and income-restricted residential units, economic development, and jobs.” Turn to page 18 to see the renderings for some of these projects. On page 16, Kristen Murphy of Acentech gives our readers tips on how to create good residential acoustics. The takeaway is be honest with your own needs and plan ahead! Tom Quinlan of South Coast Improvement shares how SCI’s unique approach to renovating senior living facilities has secured his firm over 200 projects in 13 states. 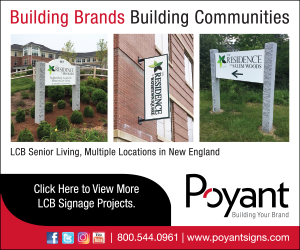 The All American Assisted Living project in Kingston, New Hampshire, is a good example of the type of assisted living and memory care communities that are being built in New England. These types of facilities specialize in creating an environment for residents with Alzheimer’s and memory disorders. Turn to page 21 to read more. Rob DiNinni, principal and founder of StageCoach Improv, has been regularly contributing articles to HP since January of this year. In this month’s edition, Rob reminds us not to multitask too much. Staying present and being in the moment can be transformative for us both personally and professionally. I struggle with this daily. Read more of Rob’s on- point article on page 29. Brian Knox of PROCON is a good example of how people in our industry are taking action to help introduce the trades to high school students. In HP’s interview with Brian Knox of PROCON, you’ll learn about the ACE Mentor Program of America and how Brian got involved on a local level. Read the full interview on page 31. The New England chapter of the International Interior Design Association (IIDA) celebrated its 12th annual design awards ceremony in March. Touloukian Touloukian won best in show for the firm’s design of Lumen at Beacon Park. Check out all the winners on page 38. This month we also have our fourth annual MEP and Energy supplement. All things related to mechanical, electrical, plumbing, and energy efficiency are the focus of the supplement, including pieces written by Jerry Alverson of BVH Integrated and Gina Rae of Timberline Communications Inc.